1 of 3 Place water in a small bowl and stir in yeast. Let stand 5 minutes. 2 of 3 In a large bowl, whisk together 2-1/2 cups of the flour, sugar and salt. Make well in the center and add the yeast mixture and olive oil. 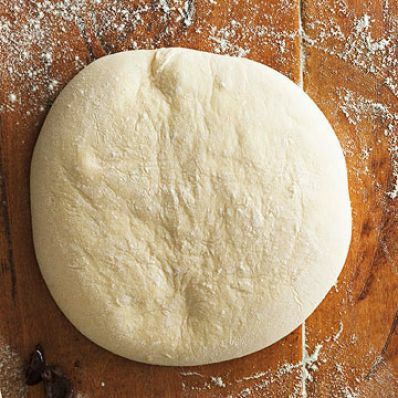 Stir until dough comes together and forms a ball. Turn out onto a well-floured surface and knead for 5 minutes, adding as much of the remaining 1/4 cup flour as needed. Form into a disk and place in a bowl that has been lightly coated with olive oil. Turn disk over and cover bowl with plastic wrap. Allow to rise in a warm place for 2 hours. 3 of 3 Remove dough from bowl and punch down. Roll out into desired diameter. Per Serving: 5 g pro., 1 g sat. fat, 191 kcal cal., 0 mg chol., 1 g fiber, 4 g Fat, total, 294 mg sodium, 34 g carb.